The rush to acquire local TV stations by media companies continued in 2014 and resulted in strong financial payoffs for them. From January to November 2014, 171 stations changed hands, at cost of about $5 billion, according to consulting firm BIA/Kelsey. This follows a wave of consolidations that took place in 2013, when about 300 local TV stations were purchased, at a total value of more than $8 billion. This leaves 589 stations in the hands of just 12 companies – up from 304 a decade ago. Ten of the 12 companies reported revenue growth through the third quarter of 2014 (January – September) compared with the same period a year earlier (21st Century Fox and Meredith operate on a fiscal year that ends June 30, therefore the revenues reported here for those two companies are for July 1 through September 30, 2014). Media General sits at the top, with $458 million in revenue for the nine months ending in September 30, 2014, an 187% growth from the previous year. During this accounting period, Media General owned 32 local TV stations in 29 markets, including 13 that it acquired in a merger with Young Broadcasting in November 2013. In March 2014, Media General announced plans to expand further by purchasing LIN Media. The merger was completed in December 2014, bringing the Media General total to 71 stations in 48 markets. 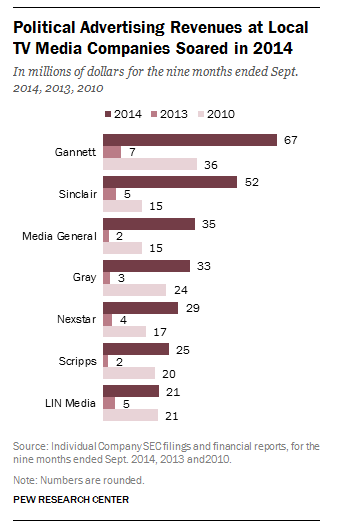 Gannett ranks second in revenue growth for this time period with a 97% increase across its 46 stations. Only CBS and 21st Century Fox, which own 30 and 28 stations respectively saw their broadcast revenue flatten compared to the same period in the previous year. CBS said the previous year’s revenue had been boosted by its Super Bowl broadcast but it also reported “softness in the advertising marketplace.” 21st Century Fox attributed its flat revenue to lower entertainment prime time ratings. One factor that has driven the interest of media companies in making big investments in local television is political ad spending, which after the Supreme Court’s Citizens United ruling seems to guarantee windfalls to local TV stations in even-numbered years. In the third quarter, local TV station groups saw positive results tied to an influx of political advertising dollars. From January to mid-October 2014, total political ad spending for local TV was about $1.3 billion, according to a Television Bureau of Advertising (TVB) analysis of Kantar CMAG data. Seven of the 12 companies report political advertising revenue separately from other types of revenue. For this group, political advertising in 2014 was more than eight times higher than the year before and the share of political advertising out of the total revenues rose to 8% in 2014 compared to just 1% in 2013. Media General enjoyed the strongest boost in the group, with an increase of more than 1,400%. Still, LIN Media’s political advertising revenues, which saw the smallest growth, were up 360%. Moreover, the group’s political advertising revenues rose 77% since the last midterm elections in 2010.